Investing in gold hasn’t changed much over the years. Considered a safe investment, gold hasn’t lost its appeal among investors today. Some people love investing in gold and some do it reluctantly, but at times of crisis or market volatility when there is high economic instability, people shy away from investing into stocks and sink all of their savings into gold in order to seek security. That’s the lure of gold and it’s hard for people to not fall for it. Buying gold during such troubled times seems to be a prudent choice and works out for the buyer in the end, as the precious yellow metal tends to rise in value when other assets and financial instruments take a plunge. Even though it rarely fails to perform well during times of distress, it cannot be valued, and the price gains could be reversed in the aftermath of a crisis. If you are looking to add gold to your financial portfolio, here are some things to consider. Many financial advisors recommend investing in gold to clients that are looking to diversify their portfolio. Diversifying one’s portfolio is about having assets that are subject to different degrees of risk and behave differently in different conditions: put simply, you buy bonds because their value goes up when stocks nosedive. Investing in gold is a great way to diversify your portfolio and to make it less volatile, mainly because gold has a low correlation with asset classes like stocks and bonds. If you place a premium value at the security that comes with gold, then with the right timing, investing in gold might be the right thing to do. Making an allocation to gold does make sense in terms of volatility, but bear in mind that it might also decrease the expected return of your holdings. If you do decide to bite the bullet, ensure your investment doesn’t account for more than 5% to 10% of your portfolio holdings. So how do you about investing your money in gold? You can buy into the gold boom in more than a few ways, from buying gold bars and sovereigns online to securing a part stake of gold, held securely in a private vault, through a mobile app. Let’s take a brief look at them. 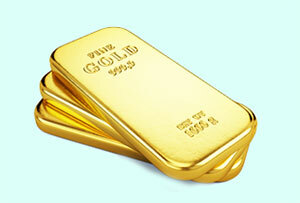 Even though it’s a lot costly, buying gold bars and coins is still one of the common and preferred way. Most people settle for bars for the obvious reasons, but then few people buy coins for the flexibility it allows at the time of selling (cutting a portion of the bar and selling it,anyone?) Holding the gold yourself basically also means no fees for anything and you’re the sole owner of the metal with no other agency in between. That being said, you’ll run the risk of your gold being stolen and have to cough up more money for home insurance. The next way to get gold is through an online dealer and have them store it for you. It’s a lot cheaper than physically holding the gold yourself and safer as well, and should be considered if you aren’t too concerned about keeping possession of the gold. Make no mistake, you’ll own the gold but won’t get to access it unless you pay a small fee to have it shipped to your home. A gold ETF is also a good match for those looking for some gold exposure in your portfolio without worrying about the hassle of storing the gold. If you care more about the price than owning the shiny metal yourself, a gold ETF will make sense to you. Before investing, decide whether you want to keep the gold yourself or just have access to the price. If you’re going to buy physical gold and wondering where to buy gold bars now, here is a great online dealer with good reputation. They have a good selection of professionally made gold bars featuring exquisitely crafted engravings that look beautiful.